The Rood Cross was constructed in memory of the men and women of the diocese who died in service or were killed in action during World War One. The Rood Cross hangs above the centre of the chancel. 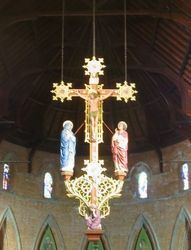 The two-thirds life size figures were carved from English Oak in England by John Bridgeman and the cross and tracery by Fred W. Tod in Sydney. 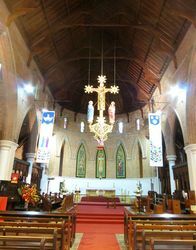 It was installed by the late Bishop Oliver Feetham. The cross was sensitively restored and painted by the late Stan Moses. A magnificent piece of ecclesiastical woodwork has recently been completed in Sydney by Messrs. Frederick W. Tod and Co., of Dawson-street, South Sydney. This takes the form of a memorial rood which has been executed for St. James' Cathedral, Townsville, in memory of the men and women of that diocese who gave their lives in the great war. 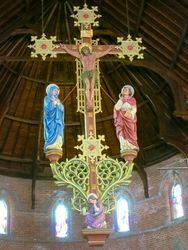 The rood, which is constructed in solid oak, stands 10ft high and is 6ft 6in in width. Roughly 400 superficial feet of oak have been used in its construction. It weighs approximately half a ton. The attendant figures with the Cross represent the Saviour, and, on either side, the Virgin Mary and St. John. At the foot of the cross is the figure of St. Mary Magdalene. The figures, the three larger ones standing about 4ft 8in. in height, were executed by a firm of English sculptors, and the whole design is also that of an English firm. The figures are most magnificently wrought, and their expression is extraordinarily natural, that of the Saviour being most striking in its compassion. The ornamental and general constructional work has been very faithfully carried out by Messrs. Tod and Co. The cost of the rood is something over £400. Although usually placed above the chancel screen this particular rood will, when in position, hang from the beams on strong chains. At present, by arrangement with the Rev. Clive Statham, it is housed In Christ Church, George-street, where It will remain until next Sunday to enable those interested to see it. Sydney Morning Herald, 18th January 1923.